Crop losses due to insects could nearly double in Europe’s bread basket due to climate EurekAlert! Climate change projected to boost insect activity and crop loss, researchers say EurekAlert! Well, at least we know who is keen to reprint press releases from Alarmist Central. I am not an entomologist, not are the journalists who are piling on this story. So let’s hear from some insect experts. Adult insects generally are of smaller body size when larvae are reared at higher temperatures. For example, females of Bicyclus butterflies reared at 20°C were larger than those reared at 27°C. Moreover, females laid larger eggs when they were reared or acclimatized for 10 days at the lower temperature compared to the higher temperature. LDT: actual lower developmental threshold; T0: predicted lower developmental threshold; UDT: upper developmental threshold; TO: thermal optimum (maximum) for developmental rate. Total optimum for population growth is usually at moderate temperatures, not at such high extremes. Development time (dt) is the time required to complete specified stage or instar and can be described as dt = SET/(T-T0). SET is the sum of effective temperatures or “thermal constant,” expressed as the number of degree days. T0 is the lower developmental threshold (LDT, or base temperature Tb), the hypothetical temperature at which developmental time would be infinite or developmental rate would be zero. The product of developmental time and the amount to which ambient temperature is above the threshold was found to be constant (= SET), that is, development will take a fixed number of degree days essentially independent of the temperature at which the animal is reared. The thermal parameters are determined in defined conditions (set of constant temperatures, suitable nutrition). The LDT and SET values are population-specific characteristics. The LDT values are similar for all developmental stages of a given population, even when they develop in diverse seasons and experience disparate temperature fluctuations. The stability of LDT is manifested as developmental rate isometry, that is, the percentage of time spent in a particular stage at any constant physiological temperature is a stable fraction of the entire developmental time. Tropical species have higher values of LDT than temperate ones. SET decreases as LDT increases. Insects that have spread to temperature zones from the tropical regions often maintain a high LDT and can reproduce and develop only in the hot season, spending most of the year in a state of dormancy. A general response of insects to temperatures just below their LDT or above their UDT is the cessation of development and reproduction while the insects remain active and feed. The larvae may slowly grow and the adults accumulate reserves. These processes are terminated at more extreme temperatures. During cooling, motility gradually decreases. At certain temperature, the neural and muscular activities are impaired and the insect lapses into cold stupor (chill coma). The stupor point is as high as 12°C in tropical insects including stored product pests, and in honey bees, around 5°C in many temperate species, near 0°C in most overwintering insects, and even below the freezing point in species living in very cold areas. Gradual warming above UDT, which is for many species around 35°C but is never sharply delimited, increases the metabolic rate, loss of water, and motility. Around 40°C, the water loss increases sharply: the spiracles are wide open and the melting of cuticular lipids permits evaporation through the body surface. Exhaustion of water and nutrients leads to rapid decrease of motility and a drop of transpiration. At a certain temperature, heat stupor occurs. Survival at temperatures above the threshold is a function of temperature and length of exposure. Warming to the absolute upper lethal temperature, which is usually around 50-55°C, causes fast, irreversible tissue damage and death. And then from Australia Responses to Climate Change Upper thermal limits in terrestrial ectotherms: how constrained are they? The data for terrestrial ectotherms discussed previously point to species from mid-latitudes in particular being closest to their thermal maxima. Moreover, although data are still quite scanty, species may have only a limited capacity to deal with changes in upper thermal limits. 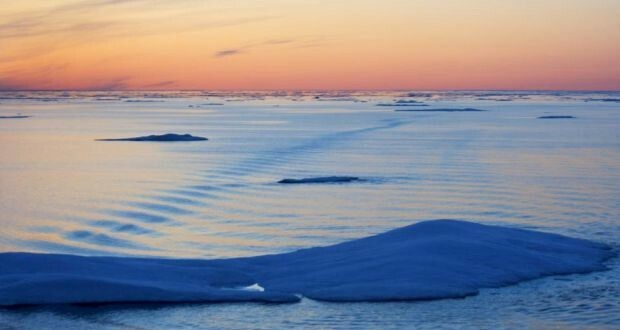 Under an expected 2–4 °C warming scenario (IPCC 2007), mid-latitude populations near limits are likely to face the threat of extinction because they cannot adapt to new environmental conditions. There is almost no information on how thermal limits are influenced by combinations of stressors. Changes in the conditions that organisms experience during thermal stress could lead to quite unpredictable upper thermal limits (Terblanche et al. 2011; Overgaard, Kristensen & Sørensen 2012). Moreover, thermal stress can influence susceptibility to other selective agents; tropical Bicyclus anynana butterflies lose immune function as measured by phenoloxidase (PO) activity and haemocyte numbers when exposed to warm conditions, and the effects are particularly marked when adults have a limited food supply. These scares always sound plausible, but on closer inspection are simplistic and unrealistic. The above shows that each type of insect has a range of temperatures they can tolerate and allow them to develop. They are stressed and populations decrease when colder than the lower limit and also when hotter than the upper limit. Every species will adapt to changing conditions as they always have. Those at their upper limit will decline, not increase, and their place will be taken by others. Of course, if it gets colder, the opposite occurs. Don’t let them scare you that insects are taking over. August 23, 2018 . At least 22 vessels are affected and several have turned back to Greenland. S/V CRYSTAL (Polish Crew) at Fort Ross Nunavut waiting Franklin ice and weather window to dash westward toward Nome Alaska. 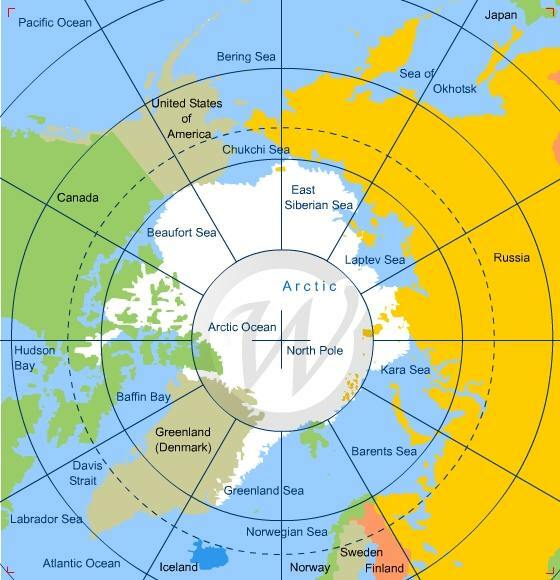 They are hoping for a storm Sept. 1-2 to open Franklin Strait where is the thick red ice. Plan B is to wait another week for a wider weather window and more ice disintegration. Plan C is to escape to the east. August 26: FRANKLIN continues to improve with less ice and could be open by the first full week of September. The background paper commissioned by the UN Secretary-General’s IGS states that biophysical realities are driving the transition to postcapitalism by the decline of what made ‘endless growth capitalism’ possible in the first place: abundant, cheap energy. What needs to be done – in social and material terms? It is a blatant call for a supra-national new world order necessitated by climate change. Pointing to the susceptibility of democratic governments to interest groups that have an economic stake in maintaining the status quo, these environmentalists doubt democracy is up to the challenge of climate change at all. Others note that human inertia is so great that, barring a catastrophic event, the best democratic governments can do is to adapt to climate change — i.e., building sea walls around vulnerable cities. More of them are saying that, to make the hard decisions needed to deal effectively with climate change, it may be eventually be necessary to put democracy on hold, opting instead for some kind of environmental authoritarianism. But why should we believe such radical concentration of power would be good for the planet? What is the evidence for such claims? As it happens we have empirical evidence to test this assertion that socialism is superior to capitalism for saving the natural environment. David Legates points out recent historical examples where two modern societies were split, one part to develop for 50 years under a socialist autocracy and the other part under a free market democracy. What can we learn from these two experiments: North/South Korea and East/West Germany? Excerpts in italics with my bolds. With growing alarmism over carbon dioxide-induced climate change, many activists have turned toward socialism as a viable way to limit carbon-dioxide emissions. The collectivist model is perfect for top-down control over the general public as, supposedly, the government can then enact legislation to defend the environment and protect against climate change. Capitalism, it is argued, is a system based on greed, and its economic bottom line trumps the need for clean air and clean water. By contrast, the socialist model should provide a much cleaner environment as pollution (including carbon dioxide by its erroneous inclusion as a pollutant by alarmists) is anathema to the collective whole. In a nutshell, the argument is that capitalism cannot provide the ingenuity and resilience necessary to provide a sustainable environment. The only hope, therefore, is the limitation to growth that socialism provides. Li laments that the core of the environmental movement lies in the upper middle classes of capitalist societies who erroneously believe that technology can provide a solution to climate alarmism. In his view, the real problem, of course, is the capitalist lifestyle, which is unsustainable as it requires unlimited economic growth. By contrast, socialism provides the perfect solution in which growth can be limited by a benevolent government whose sole interest lies in protecting the collective whole. Indeed, the term eco-socialism (or Hospice Earth) has been coined to describe the concept that socialism can “replace capitalism’s need for endless material growth with more environmentally sustainable alternatives of production to meet genuine human needs.” It is argued that eco-socialism can transform energy production such that the global society can avoid declines in human populations and all sociopolitical conflicts. So how does this relate to The Experiment? If this line of reasoning is to be believed, then the socialist-oriented countries should be better suited to environmental preservation and sustainability than their capitalist counterparts. Or at the very least, the plans should have been in place for a cleaner environment, if the effect of other socio-economic maladies had not taken precedence. What are the facts? In 1990, Greenpeace labeled Bitterfeld, East Germany, as “the dirtiest place in the most polluted country in the world.”40 Sulfur dioxide permeated the air at levels five times that of West Germany, and 75 percent of the trees were dead. A Bitterfeld chemical plant put 10 times as much mercury into the Saale River each day as a comparable West German plant would dump into the Rhine River in a year. 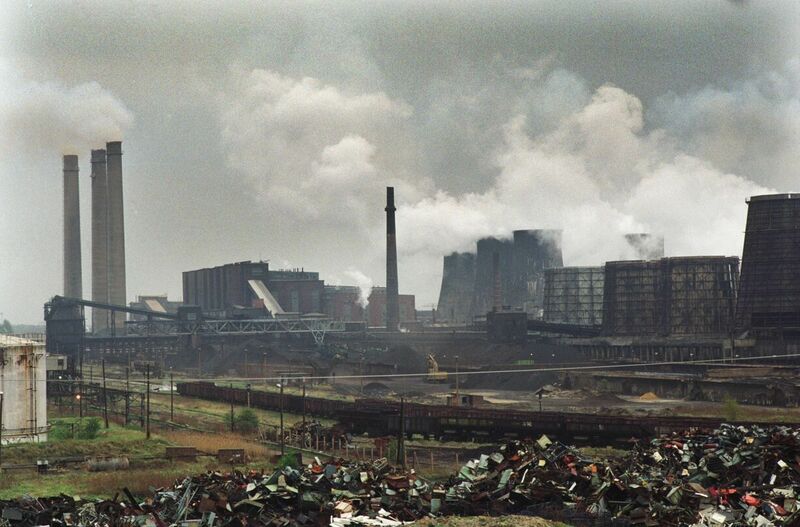 Unfortunately, the situation in East Germany was not unique; most Soviet satellite countries in Eastern Europe experienced the same environmental degradation. 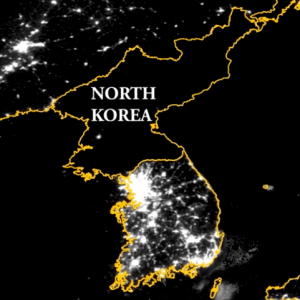 The two Koreas seen from space at night. North Korea has not fared any better under its brand of socialism. Environmental disasters plague the North, whereas South Korea thrives in abundance. Air pollution is extreme due to both the extensive combustion of coal without sulfur scrubbers and winds that blow polluted air in from China. Cutting of firewood for home heating and cooking has led to serious deforestation and concomitant soil erosion. Large cities have sewage treatment, but wastewater in rural areas is still deposited untreated into rivers. Any effort at environmental protection becomes subservient to production and the desire for full employment. Despite 25 years of technological advancement since the end of East Germany, present-day conditions in North Korea are really no better. So why doesn’t the environmental movement see that capitalist societies are cleaner than socialist countries and gravitate toward capitalist solutions? Some environmentalists do; however, the concern over carbon dioxide has subverted common sense. Capitalist nations emit fewer pollutants but more carbon dioxide. By contrast, socialist societies are less technologically developed and, consequently, they emit less carbon dioxide. For example, per capita emissions of carbon dioxide in South Korea are almost four times as great as in North Korea. In a world in which carbon dioxide is the only currency, environmentalists are enamored with the small carbon-dioxide footprint that socialism affords. When carbon-dioxide emissions are labeled as the greatest threat to humanity, North Korea becomes a world leader in environmental sustainability, and socialism is the tool by which global compliance can be afforded. Socialism works for the environmentalist because of several qualities. First, socialism is a collective state, thereby making personal preferences subservient to the state’s determination of what is good for the collective. Moreover, property rights are held only by the state, and individuals must surrender all they own to the state. This actually has an additional backhanded benefit in that if no one owns that polluting factory or that river into which toxic waste is being dumped, there is no one to blame. The state will not self accuse. Moreover, the authoritarian underpinnings of socialism allow no tolerance for dissent to be raised about what the state is—or isn’t—doing to protect the environment. Coercion is a necessary ingredient for socialism, and concomitantly many environmental policies, to be advanced. Further, its authoritarian base allows it to dictate policy, the outcome that environmentalists desire. But the real issue is that socialism lags behind capitalist societies in the production of both wealth and technology. Socialists inherently see the restriction of energy and its availability as necessary to further their collective ideals. Without affordable, abundant energy, democracy may never have developed in Europe and Southeast Asia and led to Western Europe, Japan, South Korea, and the United States becoming leaders in innovative thinking. Availability of inexpensive energy leads to remarkable increases in industry and worker efficiency, in wages and available free time, and in living standards and human health. Ultimately, this has allowed capitalists to develop the ability to be good environmental stewards. Indeed, the air and water in capitalist countries are much cleaner than in their socialist counterparts. It stands to reason that the availability of free time afforded by capitalism has allowed civilization to become more environmentally conscious. Environmental issues are the least of one’s concerns if one is in dire need of food, clothing, shelter, and safety. The abject poverty of many nations is looked upon with admiration by some environmentalists, even though poor countries pay little attention to their environmental health. It is criminal that environmentalists are willing to pay poor countries to remain in their current condition rather than develop the technology to further expand their economies and lift themselves from poverty. Remember, carbon dioxide is environmentalists’ currency, and delimiting its emission is their overarching goal. The environment under socialism fares no better. It is incontestable that pollution is horrendous in many of the poorest countries with the lowest levels of political and economic freedom. By contrast, countries with the greatest levels of political and economic liberty tend to be the cleanest and the wealthiest. With merger of the two Germanys and the failure of Soviet communism, the appeal of ecologically motivated authoritarianism waned, although the ideas remained. It has re-emerged today and is modeled after modern day China rather than the Soviet Union. Although they eschew full centralized control, environmentalists see an authoritarian state as the key to allow governments to subordinate individual rights and democratic methods. Unfortunately, this type of regime can only return a society to the environmental degradation of East Germany or North Korea. Since greenhouse gases such as carbon dioxide are now the only concern of most environmentalists, they ignore the filth and degradation that actually accompany socialist societies. The key ingredient that separated West from East Germany and still separates South from North Korea is freedom. Freedom is the elixir that fuels innovation, supports a diversity of thought, and allows people to become who they want to be, not what the state demands they must be. When the government guarantees equality of outcomes, it also stifles the creativity, diversity, ingenuity, and reward systems that allow people and countries to grow, develop, and prosper. Energy availability is a necessary ingredient for freedom. Oppression—and indeed socialism is an oppressive political economic system—flourishes when citizens remain poor and deprived of technology. Freedom thrives when citizens have both the time and the ability to travel, communicate, innovate, and organize to better their lives or to fight a common enemy. Both versions of The Experiment have proven this. Unfortunately, forgetful, unobservant, and ideological politicians in the U.S. are again touting the supposed benefits of socialism. They believe that capitalism is greedy and evil—and socialism, if “properly implemented,” will take us forward to realizing a better future. 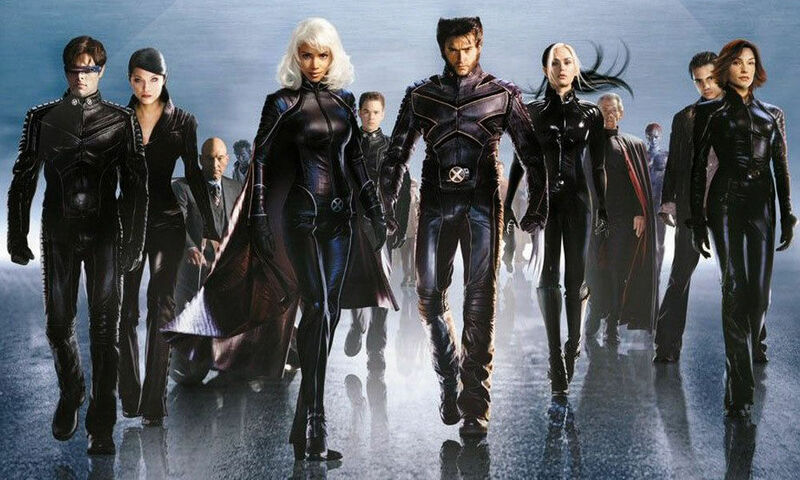 “Trust me, this time it will be different,” they say. The next experiment is underway—in Venezuela. It is showing, once again, that those who turn toward the sirencall of socialism always crash upon its rocks. Because of obsession with CO2, flooding in Kerala S. India is the latest example of the desire to pin the blame on “climate change”. Jonathan Eden wrote a balanced article in WION Why it’s so hard to detect the fingerprints of global warming on monsoon rains Excerpts in italics with my bolds. With Hurricane Harvey making landfall in Texas as a Cat 4, the storm drought is over and claims of linkage to climate change can be expected. So far (mercifully) articles in Time and Washington Post have been more circumspect than in the past. Has it become more respectable to look at the proof supporting wild claims? This post provides background on X-Weathermen working hard to claim extreme weather as proof of climate change. The antidote to such feverish reporting is provided by Mike Hulme in a publication: Attributing Weather Extremes to ‘Climate Change’: a Review (here). He has an insider’s perspective on this issue, and is certainly among the committed on global warming (color him concerned). Yet here he writes objectively to inform us on X-weather, without advocacy: real science journalism and a public service, really. Excerpts below with my bolds. In this third and final review I survey the nascent science of extreme weather event attribution. The article proceeds by examining the field in four stages: motivations for extreme weather attribution, methods of attribution, some example case studies and the politics of weather event Attribution. In recent decades the meaning of climate change in popular western discourse has changed from being a descriptive index of a change in climate (as in ‘evidence that a climatic change has occurred’) to becoming an independent causative agent (as in ‘climate change caused this event to happen’). Rather than being a descriptive outcome of a chain of causal events affecting how weather is generated, climate change has been granted power to change worlds: political and social worlds as much as physical and ecological ones. To be more precise then, what people mean when they ask the ‘extreme weather blame’ question is: ‘Was this particular weather event caused by greenhouse gases emitted from human activities and/or by other human perturbations to the environment?’ In other words, can this meteorological event be attributed to human agency as opposed to some other form of agency? Hulme shows what drives scientists to pursue the “extreme weather blame” question, noting four motivational factors. Why have climate scientists over the last ten years embarked upon research to provide an answer beyond the stock phrase ‘no individual weather event can directly be attributed to greenhouse gas emissions’? There seem to be four possible motives. The first is because the question piques the scientific mind; it acts as a spur to develop new rational understanding of physical processes and new analytic methods for studying them. A second argument, put forward by some, is that it is important to know whether or not specific instances of extreme weather are human-caused in order to improve the justification, planning and execution of climate adaptation. A third argument for pursuing an answer to the ‘extreme weather blame’ question is inspired by the possibility of pursuing legal liability for damages caused. . . If specific loss and damage from extreme weather can be attributed to greenhouse gas emissions – even if expressed in terms of increased risk rather than deterministically – then lawyers might get interested. The liability motivation for research into weather event attribution also bisects the new international political agenda of ‘loss and damage’ which has emerged in the last two years. . . The basic idea is to give recognition that loss and damage caused by climate change is legitimate ground for less developed countries to gain access to new international climate adaptation funds. A final reason for scientists to be investing in this area of climate science – a reason stated explicitly less often than the ones above and yet one which underlies much of the public interest in the ‘extreme weather blame’ question – is frustration with and argument about the invisibility of climate change. . . If this is believed to be true – that only scientists can make climate change visible and real –then there is extra onus on scientists to answer the ‘extreme weather blame’ question as part of an effort to convince citizens of the reality of human-caused climate change. Attributing extreme weather events to human influences requires different approaches, of which four broad categories can be identified. The first and most general approach to attributing extreme weather phenomena to rising greenhouse gas concentrations is to use simple physical reasoning. General physical reasoning can only lead to broad qualitative statements such as ‘this extreme weather is consistent with’ what is known about the human-enhanced greenhouse effect. Such statements offer neither deterministic nor stochastic answers and clearly underdetermine the ‘weather blame question.’ It has given rise to a number of analogies to try to communicate the non-deterministic nature of extreme event attribution. The three most widely used ones concern a loaded die (the chance of rolling a ‘6’ has increased, but no single ‘6’ can be attributed to the biased die), the baseball player on steroids (the number of home runs hit increases, but no single home run can be attributed to the steroids) and the speeding car-driver (the chance of an accident increases in dangerous conditions, but no specific accident can be attributed to the fast-driving). 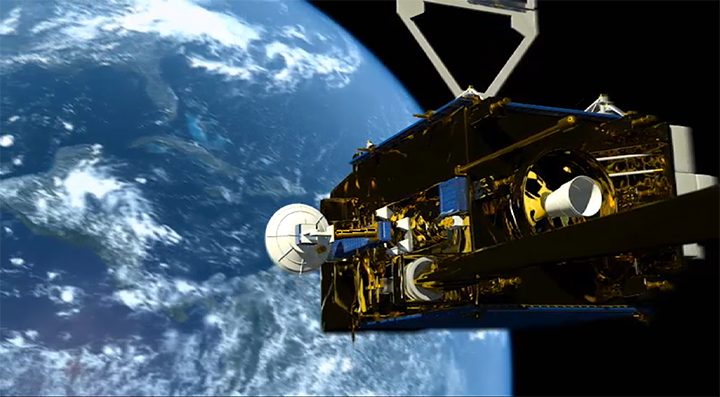 A second approach is to use classical statistical analysis of meteorological time series data to determine whether a particular weather (or climatic) extreme falls outside the range of what a ‘normal’ unperturbed climate might have delivered. All such extreme event analyses of meteorological time series are at best able to detect outliers, but can never be decisive about possible cause(s). A different time series approach therefore combines observational data with model simulations and seeks to determine whether trends in extreme weather predicted by climate models have been observed in meteorological statistics (e.g. Zwiers et al., 2011, for temperature extremes and Min et al., 2011, for precipitation extremes). This approach is able to attribute statistically a trend in extreme weather to human influence, but not a specific weather event. Again, the ‘weather blame question’ remains underdetermined. The single observational record available to us, and which is analysed in the statistical methods described above, is inadequate for this task. The solution is to use multiple model simulations of the climate system, first of all without the forcing agent(s) accused of ‘causing’ the weather event and then again with that external forcing introduced into the model. The credibility of this method of weather attribution can be no greater than the overall credibility of the climate model(s) used – and may be less, depending on the ability of the model in question to simulate accurately the precise weather event under consideration at a given scale (e.g. a heatwave in continental Europe, a rain event in northern Thailand) (see Christidis et al., 2013a). A fourth, more philosophical, approach to weather event attribution should also be mentioned. This is the argument that since human influences on the climate system as a whole are now clearly established – through changing atmospheric composition, altered land surface characteristics, and so on – there can no longer be such a thing as a purely natural weather event. All weather — whether it be a raging tempest or a still summer afternoon — is now attributable to human influence, at least to some extent. Weather is the local and momentary expression of a complex system whose functioning as a system is now different to what it would otherwise have been had humans not been active. Hulme provides a table of numerous such studies using various methods, along with his view of the findings. It is likely that attribution of temperature-related extremes using FAR methods will always be more attainable than for other meteorological extremes such as rainfall and wind, which climate models generally find harder to simulate faithfully at the spatial scales involved. As discussed below, this limitation on which weather events and in which regions attribution studies can be conducted will place important constraints on any operational extreme weather attribution system. Hulme concludes by discussing the political hunger for scientific proof in support of policy actions. But Hulme et al. (2011) show why such ambitious claims are unlikely to be realised. Investment in climate adaptation, they claim, is most needed “… where vulnerability to meteorological hazard is high, not where meteorological hazards are most attributable to human influence” (p.765). Extreme weather attribution says nothing about how damages are attributable to meteorological hazard as opposed to exposure to risk; it says nothing about the complex political, social and economic structures which mediate physical hazards. And separating weather into two categories — ‘human-caused’ weather and ‘tough-luck’ weather – raises practical and ethical concerns about any subsequent investment allocation guidelines which excluded the victims of ‘tough-luck weather’ from benefiting from adaptation funds. Contrary to the claims of some weather attribution scientists, the loss and damage agenda of the UNFCCC, as it is currently emerging, makes no distinction between ‘human-caused’ and ‘tough-luck’ weather. “Loss and damage impacts fall along a continuum, ranging from ‘events’ associated with variability around current climatic norms (e.g., weather-related natural hazards) to [slow-onset] ‘processes’ associated with future anticipated changes in climatic norms” (Warner et al., 2012:21). Although definitions and protocols have not yet been formally ratified, it seems unlikely that there will be a role for the sort of forensic science being offered by extreme weather attribution science. Thank you Mike Hulme for a sane, balanced and expert analysis. It strikes me as being another element in a “Quiet Storm of Lucidity”. Note: MDR refers to the Main Development Region for tropical storms. It has been a changeable and at times extreme spring and summer. The cold and snow of March gave way to a cold April and some very chilly days well into the spring. Warmth with some very hot days followed in the early to mid summer. Then the rains came with strong thunderstorms. The wet August spell put an end to a borderline drought spell the last few years. It became very muggy, keeping nighttime temperatures up and air conditioners on. The changes all have to do with the wind direction. The jet stream brought chilly air masses (and snow) into eastern Canada even into June. The winds around these cool air masses turn to the northeast here in New England coming in off cool land and water. Then increasingly warm air masses built north into the Canadian prairies and came east. The surface winds turned northwesterly. In summer, warm air crossing the Appalachians and sinking down into the Merrimack Valley and coast heats by compression 5F or more. Our hottest days come with these ‘downslope winds’. Historically all the 100F days come with a west to northwest wind. When late July and August came, our surface winds turned southwesterly. 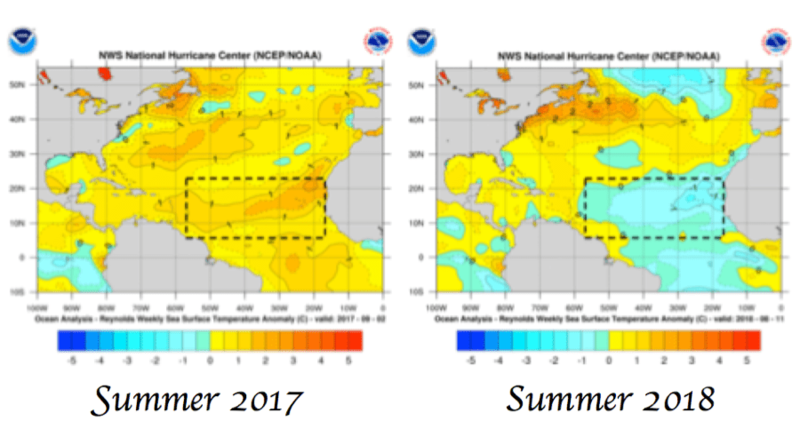 This change was caused by a sharp cooling of the subtropical Atlantic Ocean waters relative to 2017. The Atlantic cool subtropical pattern leads to that stronger than normal Atlantic high pressure called the ‘Bermuda High’. In these patterns, this regular feature of our climate expands south and west and acts as a pump for moisture much like we see in the southeastern and eastern Asia monsoon flow. This causes nights to be warm and muggy, and days very warm and showery here in the east. Uncomfortable yes, unprecedented heat no. You may be surprised that most of the extreme heat records for the region, country and world occurred in the early 20th century or earlier. The 1930s was the record decade in the United States as a whole. 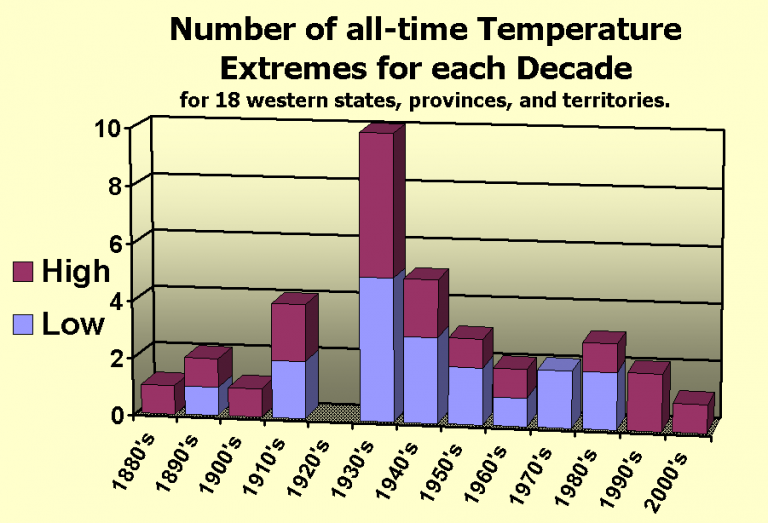 For the east, the 1950s was the warmest but extreme heat has occurred even in cold periods. As a general rule, when the subtropical Atlantic is warm, we have more hurricane activity, when it is cool, we have fewer storms. A pro-Energy East pipeline rally was met with a counter-protest Friday afternoon in Halifax, with both sides vocal about their position. “I’m here today because I’m concerned about climate change and the impact that the Energy East pipeline would have on climate change,” said Emma Norton. The proposed Energy East pipeline was cancelled last fall but some are hoping government will reconsider the project. Those in favour of the project say Canada has the highest environmental standards of any major oil and gas producer in the world and want to see more Canadian energy. “Saudi Arabia, Russia, Iran are not going to ship one less barrel of oil if Canada shuts down our energy industry so it’s not a choice about oil or no oil, the global economy has a growing global demand for oil and gas,” said Jason Kenney, leader of the United Conservative Party in Alberta. Susanne Sexton is with the group that organized the pro-Energy East rally and says Canada needs jobs. “This is a project that would unify all Canadians and when tax dollars and those workers are going to be hired to build this and people that are pulling the resources out of the ground, they’re building schools, they’re building hospitals, they’re providing money to go into social problems to provide to our elderly and our least able to care for themselves. Why are they against that?” she said. Those against the project say they’re concerned about the potential environmental risks. “The message is that we cannot build pipelines. We cannot continue to extract fossil fuels from the ground because they contribute to climate change and that’s a very urgent issue that we need to address,” said Norton. From Financial Post I helped plan Energy East, and I know the government’s excuses are bunk The former head of TransCanada’s pipeline strategy says Canada cannot afford to ignore the lessons of Energy East’s demise by Dennis McConaghy. Excerpts in italics with my bolds. I was a senior officer of TransCanada Pipelines when the Energy East project was conceived and developed commercially, up to the mid-summer of 2014 when I retired (I continue to be a shareholder but obviously I am no longer a company insider). Two things are clear to me. 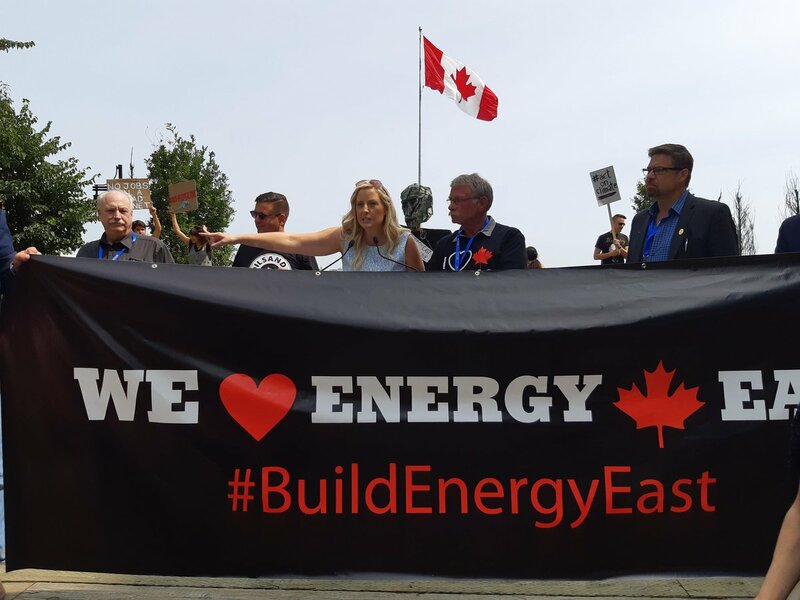 One: the termination of the Energy East project is a major economic loss for Canada, removing an important option for providing market access for growing production from Canada’s oil sands resource, including direct access to eastern Canadian crude oil markets. Two: The Trudeau government should be stepping up to accept some real culpability for contributing to TransCanada’s decision to abandon the project, instead of resorting to various sophistries and distortions. The real lessons to be learned from the Energy East termination cannot be ignored if this country is to ever have a regulatory and public-policy regime conducive for private capital to take on the risks of major hydrocarbon infrastructure. The vast majority of the $1 billion in Energy East development costs went to pursuing regulatory approval. Understand some basic facts about this project. It was conceived and developed as an all-Canadian route-alternative to access not only domestic crude oil markets in eastern Canada but also to gain tidewater access to other global markets for Canadian oil sands production, that would not otherwise be accessible. Moreover, it would convert existing underutilized gas-pipeline capacity between Alberta and eastern Ontario, thereby providing significant competitive advantage. The project successfully gained support from a diverse group of Canadian production interests, even as other pipeline projects such as Keystone XL, Northern Gateway and the Trans Mountain expansion were already in advanced stages of development, including pursuit of regulatory approval. Since TransCanada first filed with the National Energy Board in late 2014, the project has had to cope with litany of regulatory dysfunctions ranging from protracted information requests beyond the initial filing, recusal of the original NEB panel to be replaced by a panel of limited pertinent regulatory experience, failure to use the existing regulatory record prior to the recusal, inadequate security arrangements for attempted public hearings and, worst of all, the recent decision to “re-scope” the issues to be addressed in the hearing itself. From when TransCanada first conceived this project internally in late 2011, accumulated development costs have exceeded $1 billion, the vast majority relating to the pursuit of regulatory approval. No private sector entity would ever have expended such a vast amount of capital seeking regulatory approval if it had known the dimension of the regulatory and political risk. The last straw was the re-scoping decision taken by the current NEB panel, and supported by the Trudeau government. This decision concerned whether carbon emissions generated by the production process of the oil to be moved by Energy East were consistent or not with Ottawa’s carbon policy. To be clear, these are not emissions generated by the Energy East pipeline directly, but are emissions TransCanada is not responsible for. The real issue of course is whether incremental crude oil production in Canada is consistent with national carbon policy. That is not an issue to be dealt with by regulators but rather by democratically elected politicians. Dennis McConaghy was formerly the executive vice-president of pipeline strategy and development at TransCanada Pipelines. There is plenty of evidence that Quebecers, collectively, did everything they could to stand in the way of Energy East, which was to cross Quebec territory. A campaign by the Montreal Metropolitan Community, a regional organization of municipal politicians representing more than 80 area cities and towns, opposed the project on the ground its risks far outweighed its benefits. Quebec’s hostility to Energy East came in other ways, too. TransCanada had to cancel plans for a second marine terminal for Energy East at Cacouna, Que., to allay community concerns about impact on beluga whales. The NEB hearings on Energy East were suspended after violent protests in Montreal. Eventually the whole review went back to square one and was beefed up to win back public trust. The inclusion of upstream and downstream climate change impacts this summer ultimately became the regulatory overreach that went too far. Quebec’s sabotage of Energy East is not surprising considering the two-term Premier joined the province into California’s cap-and-trade scheme. He was also keen to be photographed with Al Gore at the Paris COP. What is new is a parliamentary election on October 1 with the opposition leading in the polls. Meet the man committed to action rather than pipedreams. Source: Globe and Mail. Excerpts in italics. François Legault, the man who has a serious chance of becoming the next Quebec premier and arguably the most conservative one in at least 50 years, has spent nearly as much time as a professional politician as he did a business executive. He seems genuinely surprised at the suggestion “businessman” would take second place to “politician” on his résumé. He starts doing the math out loud on what came after he founded Air Transat. Mr. Legault is a bit fussy about labels. He doesn’t like to be called a federalist, even if he believes Quebec’s place is within Canada. He wants to limit spending, cut taxes and immigration levels and seriously improve the business environment in Quebec, but denies he’s all that right-wing. Now, with 10 months until the next election, the 60-year-old Mr. Legault may be on the cusp of getting his hands on some economic levers. Three polls in a row have showed him in first place. He studied accounting and worked as an auditor and in finance before borrowing $50,000 in 1986 to help found Air Transat. He cashed out with $10-million when he entered politics 12 years later. “The reason I can be independent today is because of business,” he says. And now from the Montreal Gazette Let’s revisit Energy East and get Canada off Saudi oil Our limited capacity to move oil to the east and west coasts is costing us billions, and transferring large chunks of that cash to despots. Canada’s spat with Saudi Arabia raises an obvious question. Why is Canada, sitting on the world’s third-largest oil reserves, importing some 87,000 barrels of oil per day from Saudi Arabia, a country with a terrible civil rights record? Saudi Arabia is some 9,625 kilometres from Quebec, where Saudi oil is imported to Canada. Wouldn’t it be nice if Eastern Canada got its oil from a democratic country with an excellent record on civil rights and environmental protection, like, say, Canada? It wouldn’t be hard. A simple pipeline would completely obviate Canada’s need to import oil from the Middle East. 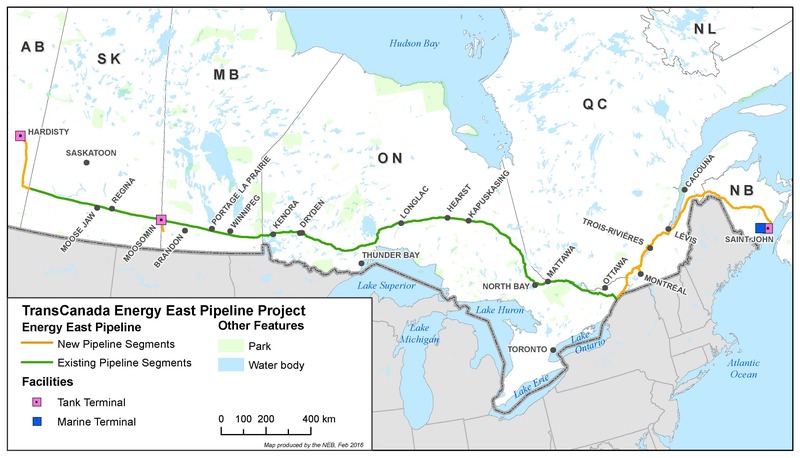 TransCanada’s proposed (now cancelled) Energy East pipeline would have carried Canadian oil over about 4,500 km, using mostly existing pipeline capacity currently used to transport natural gas from Alberta to Ontario and Quebec. With a capacity to carry 1.1 million barrels of oil per day, the pipeline would have dwarfed what Canada imports from Saudi Arabia (not to mention Algeria’s 85,000 barrels per day and Nigeria’s 74,000 barrels per day). So what happened to it? In October 2017, TransCanada withdrew its application from the National Energy Board (NEB) for the proposed $15.7-billion Energy East and Eastern Mainline pipeline projects — about five months after the NEB announced the government would consider “upstream” and “downstream” greenhouse gas emissions in the project evaluation process. The new rule targets greenhouse gases emitted during oil production (not transportation) and after the oil leaves the pipeline and is refined and consumed (again, nothing to do with oil transportation). Two studies by the Canadian Energy Research Institute (CERI) document the potential benefits of building Energy East. In 2014, CERI estimated the project would generate an additional $34 billion to the GDP, an additional 321,000 one-year/full-time equivalent jobs across Canada in construction and operation, and an additional $7.6 billion in total tax revenues for Canada. In a 2018 report, CERI models the costs and benefits of displacing imported oil with Canadian oil. This “made in Canada” scenario estimates refinery cost-savings of $23 million per year while displacing 100 per cent of foreign oil. CERI also estimates that using Canadian oil rather than imported oil would lower greenhouse gas emissions by 2 million tonnes of carbon-dioxide equivalent per year. In any sane world, Canada, with oil reserves estimated at 171 billion barrels (10 per cent of the world’s total reserves), would not need to import oil from foreign powers with strong records of religious oppression, gender oppression, international destabilization, public beheadings and other activities Canadians shouldn’t support with their oil and gasoline purchases. Rather than looking at the failure of Energy East, and simplifying (and clarifying) environmental assessment to invite investment in such projects, the Trudeau government took an already onerous and somewhat arbitrary environmental assessment process and made it even more so. The government’s new criteria for energy projects includes consideration of “gender” impacts and use of the “traditional knowledge” of Aboriginal people. Neither of these requirements lends itself to rigorous definition. Canada’s limited capacity to move oil to the East and West Coast is costing Canadians billions of dollars per year, and transferring large chunks of that money into the hands of despots. Our governments must do whatever’s needed to break Canada’s oil transport bottlenecks. The was the argument used by Trudeau government to destroy the Energy East pipeline. The same gambit is used by US activists attempting to prevent pipeline approvals issued by the Federal Energy Regulatory Commission (FERC). The article linked below gets into the details, but traditionally a project such as constructing a pipeline was assessed on the environmental impact of its installation and operation. Climatists have pushed and in instances succeeded in arguing that the fuels flowing through the pipeline cause climate change by emissions generated in the production beforehand and consumption by end users and must be estimated before approving. During the Obama administration FERC with majority Democratic appointees blocked pipelines on this basis. But now majority Republican appointees are taking the traditional more narrow scope, leaving out GHG calculations before and after transport along with Social Cost of Carbon (SCC). In fact, FERC has no jurisdiction to regulate sites producing or burning fossil fuel products The legal pushback is strenuous as noted in this article from The Legal Intelligencer FERC’s Hard Look at Pipeline Construction and GHG Emissions. Winds of energy pragmatism are starting, but whether they can blow down the believers’ house of cards remains to be seen. “The Force is Strong in Them,” unfortunately. 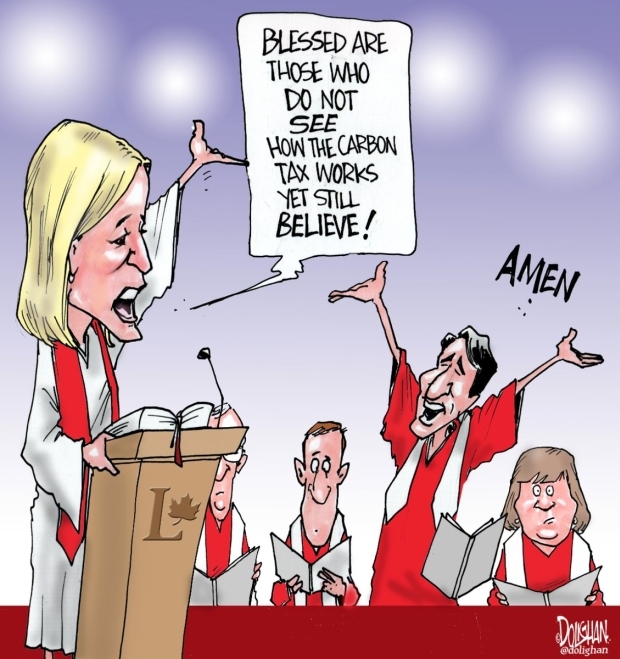 Environment Minister Catherine McKenna with Justin Trudeau in the choir. The subtitle is Climate change is real. Record-high temperatures everywhere are fake. As we shall see from the excerpts below, The first sentence is a statement of faith, since as Engbert demonstrates, the notion does not follow from the temperature evidence. Excerpts in italics with my bolds. It’s been really, really hot this summer. How hot? Last Friday, the Washington Post put out a series of maps and charts to illustrate the “record-crushing heat.” All-time temperature highs have been measured in “scores of locations on every continent north of the equator,” the article said, while the lower 48 states endured the hottest-ever stretch of temperatures from May until July. These were not the only records to be set in 2018. 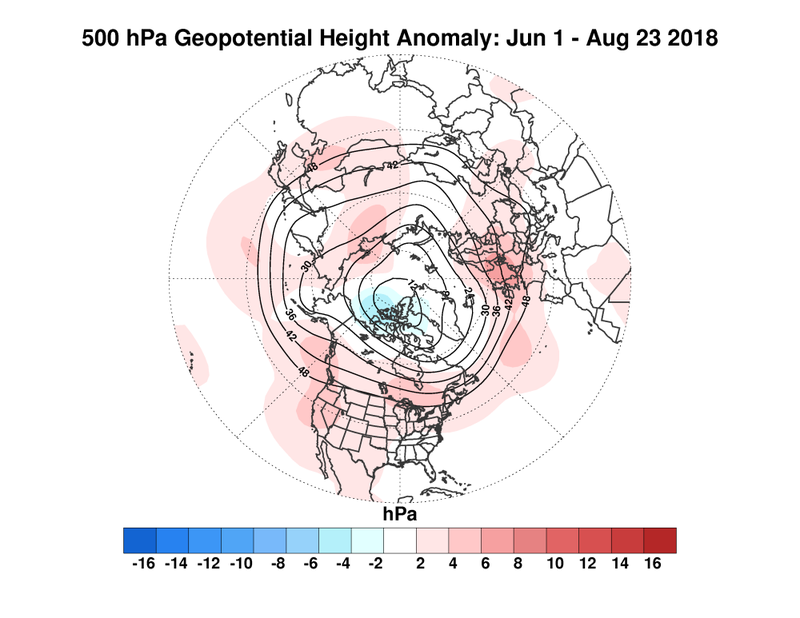 Historic heat waves have been crashing all around the world, with records getting shattered in Japan, broken on the eastern coast of Canada, smashed in California, and rewritten in the Upper Midwest. A city in Algeria suffered through the highest high temperature ever recorded in Africa. A village in Oman set a new world record for the highest-ever low temperature. At the end of July, the New York Times ran a feature on how this year’s “record heat wreaked havoc on four continents.” USA Today reported that more than 1,900 heat records had been tied or beaten in just the last few days of May. While the odds that any given record will be broken may be very, very small, the total number of potential records is mind-blowingly enormous. There were lots of other records, too, lots and lots and lots—but I think it’s best for me to stop right here. In fact, I think it’s best for all of us to stop reporting on these misleading, imbecilic stats. “Record-setting heat,” as it’s presented in news reports, isn’t really scientific, and it’s almost always insignificant. And yet, every summer seems to bring a flood of new superlatives that pump us full of dread about the changing climate. We’d all be better off without this phony grandiosity, which makes it seem like every hot and humid August is unparalleled in human history. It’s not. Reports that tell us otherwise should be banished from the news. It’s true the Earth is warming overall, and the record-breaking heat that matters most—the kind we’d be crazy to ignore—is measured on a global scale. The average temperature across the surface of the planet in 2017 was 58.51 degrees, one-and-a-half degrees above the mean for the 20th century. These records matter: 17 of the 18 hottest years on planet Earth have occurred since 2001, and the four hottest-ever years were 2014, 2015, 2016, and 2017. It also matters that this changing climate will result in huge numbers of heat-related deaths. Please pay attention to these terrifying and important facts. Please ignore every other story about record-breaking heat. You’ll often hear that these two phenomena are related, that local heat records reflect—and therefore illustrate—the global trend. Writing in Slate this past July, Irineo Cabreros explained that climate change does indeed increase the odds of extreme events, making record-breaking heat more likely. News reports often make this point, linking probabilities of rare events to the broader warming pattern. “Scientists say there’s little doubt that the ratcheting up of global greenhouse gases makes heat waves more frequent and more intense,” noted the Times in its piece on record temperatures in Algeria, Hong Kong, Pakistan, and Norway. Yet this lesson is subtler than it seems. The rash of “record-crushing heat” reports suggest we’re living through a spreading plague of new extremes—that the rate at which we’re reaching highest highs and highest lows is speeding up. When the Post reports that heat records have been set “at scores of locations on every continent,” it makes us think this is unexpected. It suggests that as the Earth gets ever warmer, and the weather less predictable, such records will be broken far more often than they ever have before. But that’s just not the case. In 2009, climatologist Gerald Meehl and several colleagues published an analysis of records drawn from roughly 2,000 weather stations in the U.S. between 1950 and 2006. There were tens of millions of data points in all—temperature highs and lows from every station, taken every day for more than a half-century. Meehl searched these numbers for the record-setting values—i.e., the days on which a given weather station saw its highest-ever high or lowest-ever low up until that point. When he plotted these by year, they fell along a downward-curving line. Around 50,000 new heat records were being set every year during the 1960s; then that number dropped to roughly 20,000 in the 1980s, and to 15,000 by the turn of the millennium. From Meehl et al 2009. This shouldn’t be surprising. As a rule, weather records will be set less frequently as time goes by. The first measurement of temperature that’s ever taken at a given weather station will be its highest (and lowest) of all time, by definition. There’s a good chance that the same station’s reading on Day 2 will be a record, too, since it only needs to beat the temperature recorded on Day 1. But as the weeks and months go by, this record-setting contest gets increasingly competitive: Each new daily temperature must now outdo every single one that came before. If the weather were completely random, we might peg the chances of a record being set at any time as 1/n, where n is the number of days recorded to that point. In other words, one week into your record-keeping, you’d have a 1 in 7 chance of landing on an all-time high. On the 100th day, your odds would have dropped to 1 percent. After 56 years, your chances would be very, very slim. The weather isn’t random, though; we know it’s warming overall, from one decade to the next. That’s what Meehl et al. were looking at: They figured that a changing climate would tweak those probabilities, goosing the rate of record-breaking highs and tamping down the rate of record-breaking lows. This wouldn’t change the fundamental fact that records get broken much less often as the years go by. (Even though the world is warming, you’d still expect fewer heat records to be set in 2000 than in 1965.) Still, one might guess that climate change would affect the rate, so that more heat records would be set than we’d otherwise expect. Source: Intellicast, using raw unadjusted data. What does all this mean? On one hand, it’s very good evidence that climate change has tweaked the odds for record-breaking weather, at least when it comes to record lows. (Other studies have come to the same conclusion.) On the other hand, it tells us that in the U.S., at least, we’re not hitting record highs more often than we were before, and that the rate isn’t higher than what you’d expect if there weren’t any global warming. In fact, just the opposite is true: As one might expect, heat records are getting broken less often over time, and it’s likely there will be fewer during the 2010s than at any point since people started keeping track. This may be hard to fathom, given how much coverage has been devoted to the latest bouts of record-setting heat. These extreme events are more unusual, in absolute terms, than they’ve ever been before, yet they’re always in the news. How could that be happening? While the odds that any given record will be broken may be very, very small, the total number of potential records that could be broken—and then reported in the newspaper—is mind-blowingly enormous. To get a sense of how big this number really is, consider that the National Oceanic and Atmospheric Administration keeps a database of daily records from every U.S. weather station with at least 30 years of data, and that its website lets you search for how many all-time records have been set in any given stretch of time. For instance, the database indicates that during the seven-day period ending on Aug. 17—the date when the Washington Post published its series of “record-crushing heat” infographics—154 heat records were broken. Now let’s say there are 130,000 high-temperature records to be broken every month in the U.S. That’s only half the pool of heat-related records, since the database also lets you search for all-time highest low temperatures. You can also check whether any given highest high or highest low happens to be a record for the entire month in that location, or whether it’s a record when compared across all the weather stations everywhere on that particular day. Add all of these together and the pool of potential heat records tracked by NOAA appears to number in the millions annually, of which tens of thousands may be broken. Even this vastly underestimates the number of potential records available for media concern. As they’re reported in the news, all-time weather records aren’t limited to just the highest highs or highest lows for a given day in one location. Take, for example, the first heat record mentioned in this column, reported in the Post: The U.S. has just endured the hottest May, June, and July of all time. The existence of that record presupposes many others: What about the hottest April, May and June, or the hottest March, April, and May? What about all the other ways that one might subdivide the calendar? Geography provides another endless well of flexibility. Remember that the all-time record for the hottest May, June, and July applied only to the lower 48 states. Might a different set of records have been broken if we’d considered Hawaii and Alaska? And what about the records spanning smaller portions of the country, like the Midwest, or the Upper Midwest, or just the state of Minnesota, or just the Twin Cities? And what about the all-time records overseas, describing unprecedented heat in other countries or on other continents? Even if we did limit ourselves to weather records from a single place measured over a common timescale, it would still be possible to parse out record-breaking heat in a thousand different ways. News reports give separate records, as we’ve seen, for the highest daily high and the highest daily low, but they also tell us when we’ve hit the highest average temperature over several days or several weeks or several months. The Post describes a recent record-breaking streak of days in San Diego with highs of at least 83 degrees. (You’ll find stories touting streaks of daily highs above almost any arbitrary threshold: 90 degrees, 77 degrees, 60 degrees, et cetera.) Records also needn’t focus on the temperature at all: There’s been lots of news in recent weeks about the fact that the U.K. has just endured its driest-ever early summer. “Record-breaking” summer weather, then, can apply to pretty much any geographical location, over pretty much any span of time. It doesn’t even have to be a record—there’s an endless stream of stories on “near-record heat” in one place or another, or the “fifth-hottest” whatever to happen in wherever, or the fact that it’s been “one of the hottest” yadda-yaddas that yadda-yadda has ever seen. In the most perverse, insane extension of this genre, news outlets sometimes even highlight when a given record isn’t being set. Loose reports of “record-breaking heat” only serve to puff up muggy weather and make it seem important. (The sham inflations of the wind chill factor do the same for winter months.) So don’t be fooled or flattered by this record-setting hype. Your summer misery is nothing special. This article helps people not to confuse weather events with climate. My disappointment is with the phrase, “Climate Change is Real,” since it is subject to misdirection. Engber uses that phrase referring to rising average world temperatures, without explaining that such estimates are computer processed reconstructions since the earth has no “average temperature.” More importantly the undefined “climate change” is a blank slate to which a number of meanings can be attached. Some take it to mean: It is real that rising CO2 concentrations cause rising global warming. Yet that is not supported by temperature records. Others think it means: It is real that using fossil fuels causes global warming. This too lacks persuasive evidence. Others know that Global Mean Temperature is a slippery calculation subject to the selection of stations. Global warming estimates combine results from adjusted records. The pattern of high and low records discussed above is consistent with natural variability rather than rising CO2 or fossil fuel consumption. Those of us not alarmed about the reported warming understand that “climate change” is something nature does all the time, and that the future is likely to include periods both cooler and warmer than now. What is Global Temperature? Is it warming or cooling?